In order to enable Rescue or stabilisation modes you have to set Stabi/Function to a desired option. When Disabled, no special function will be used. It is possible to set a different functions between Banks. For normal flying a positive Gyro Gain is used. To activate function which is selected in the parameter Stabi/Function it is necessary to set a negative gyro gain. The function is active as long as the Gyro Gain is negative. Then the normal flight is engaged again. Because unit allow to set the Gyro Gain by your transmitter or directly in the software, you have two options how to do that. This will set a moderate Gyro Gain and allow to select which mode will be used anytime during the flight. Do not forget to set the gains accordingly for your model. 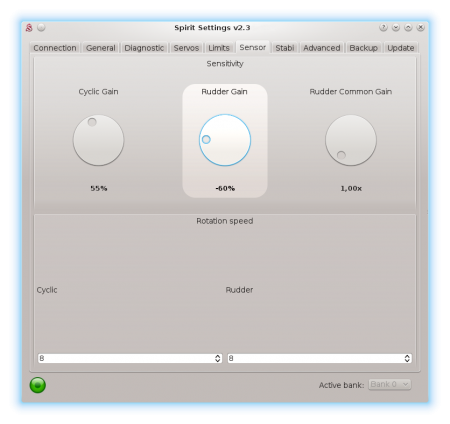 Also make sure that the Gyro Gain function is assigned in the software. When you do not want to or can't set your Gyro Gain in the transmitter, you can do so in the software. There is only requirement to unassign the Gyro Gain function in the General/Channels window. This mean that transmitter have no control over the Gyro Gain. Instead the value is configured by the Sensor/Rudder Gain parameter. There is disadvantage that in order to activate selected function, you have to set a negative Rudder Gain. This can't be changed during the flight normally. On the other hand, you can use a Bank Switching feature and program a different Function and Rudder Gain for each bank. Following table is describing how Gyro Gain can activate selected Function. 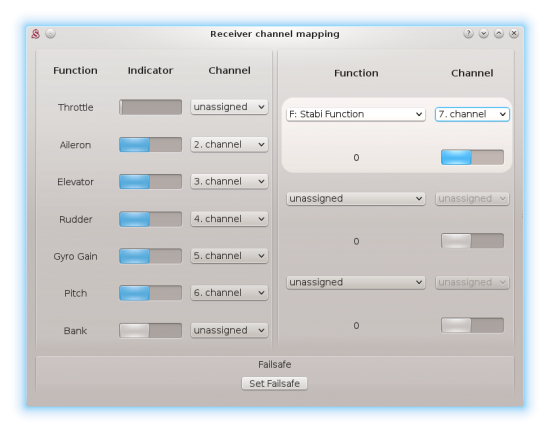 Function in the Stabi/Function parameter will be activated by a dedicated channel selected in the General/Channels. In the right part of the Channels window, select F: Stabi Function. 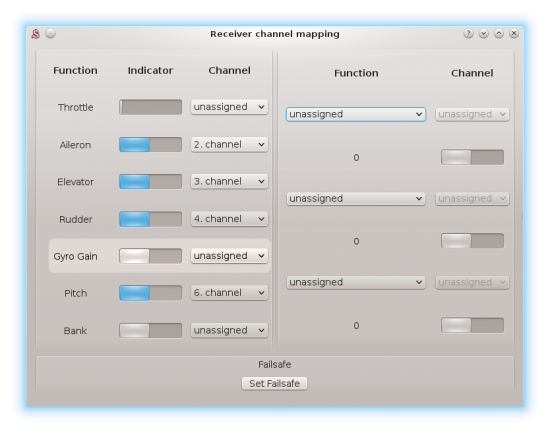 Then select a channel that you can use for the activation. Assign a switch in your transmitter that will control the channel (assigned channel should react now). 0 - function is inactive. 1 - function is active. Gyro Gain can still change gyro mode (Head-Lock or Normal). Positive Gyro Gain value will activate Head-Lock mode always. Active Function and Gyro mode is always visible in the Diagnostic tab. Following table is describing how selected Channel can activate the Function. Flight Mode "-" mean that the function is inactive and a normal flight regime is on. This page was last modified on 7 February 2018, at 13:22.